The Lorax by Dr. Seuss is a classic tale about an environmental disaster in a world where a greedy business-person (the Once-ler) cuts down all the Truffula trees to make Thneeds. The story begins long after the devastation, with a young boy coming to see what has happened, seeking out the Once-ler. When the boy finds the Once-ler, he settles in for the long tale of the Lorax and his warnings. As the Once-ler's story unfolds, the effects of each tree being cut down reverberate throughout the environment, with species after species being driven away. 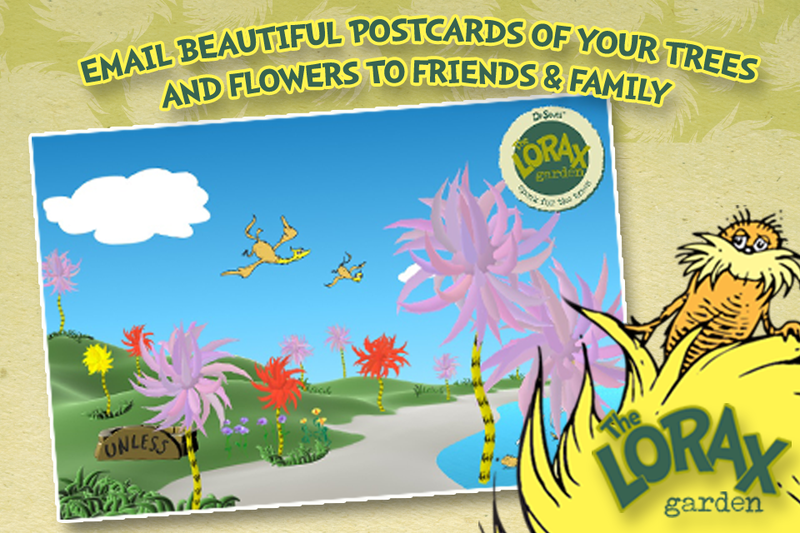 The Lorax himself is a strange little creature that 'speaks for the trees' because 'trees have no tongues'. He sends the species, one by one, to another unknown environment that is not being destroyed. Since the Lorax's warnings go unheeded, eventually the entire environment is devastated and even the Once-ler finds himself with nothing to show for his greed. He does have one thing to share with the boy, though, a last 'Truffula' tree seed. And he tells him to plant it, to restore the forest perhaps. 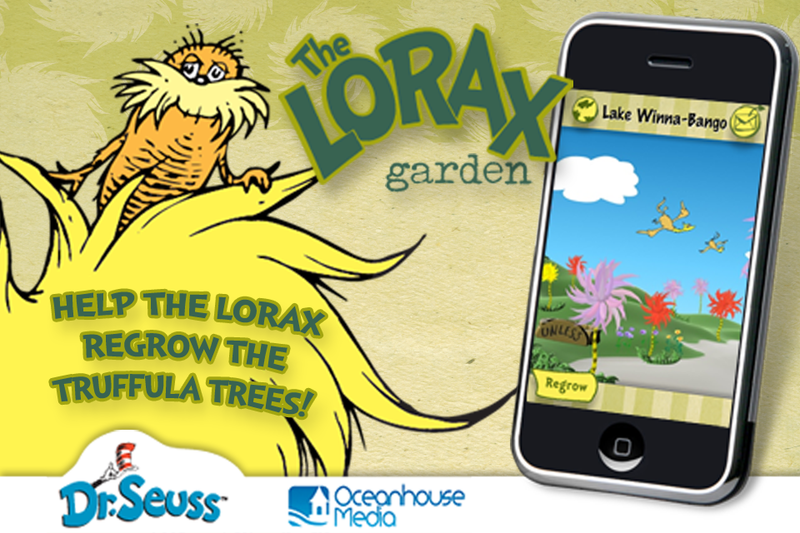 The Lorax is one of many titles to come to the iPad/iPhone from Oceanhouse Media. The story is narrated and features the original images from the book. 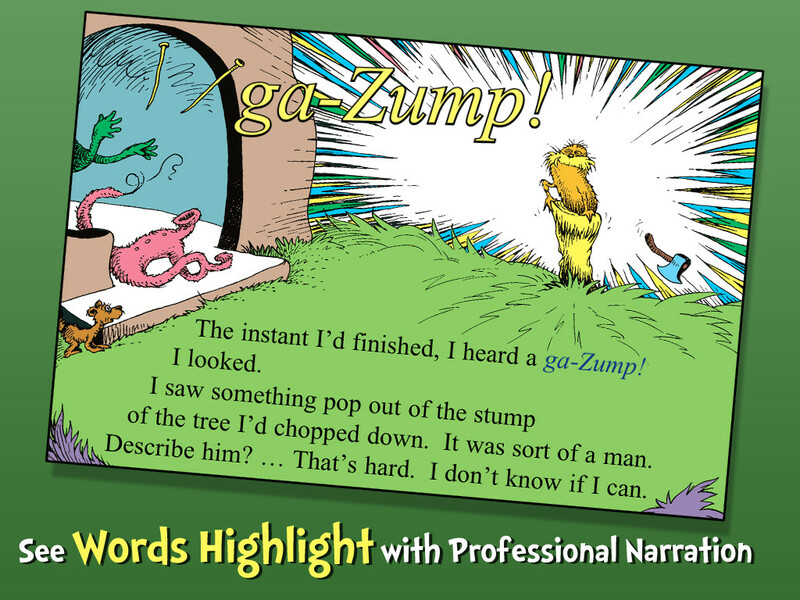 These Dr. Seuss books have no real animation, although most of the items pictured in the story react to a light tap with a visual image of the word with accompanying audio (for example, tap on the boy and the word "boy" appears with audio saying “boy”). These word 'interactions' are literally hidden all over every page. This book also has great sound effects of animal & bird sounds, plus a lot of 'creepy' wind sounds that reinforce the scenes of environmental devastation in a way only good audio can. This book, unlike some of the other Seuss books I've reviewed earlier this month, is not specifically geared toward children learning to read, although for slightly older readers it is a good choice. The topic is a bit heavy, compared to many other Seuss titles, and has a dark side for sure. But I remember it fondly from my childhood, particularly for the classic Seuss illustrations of fantastical things. This is a nice edition in digital form and brought back many fond memories. The Lorax is a children's book, written by Dr. Seuss and first published in 1971. 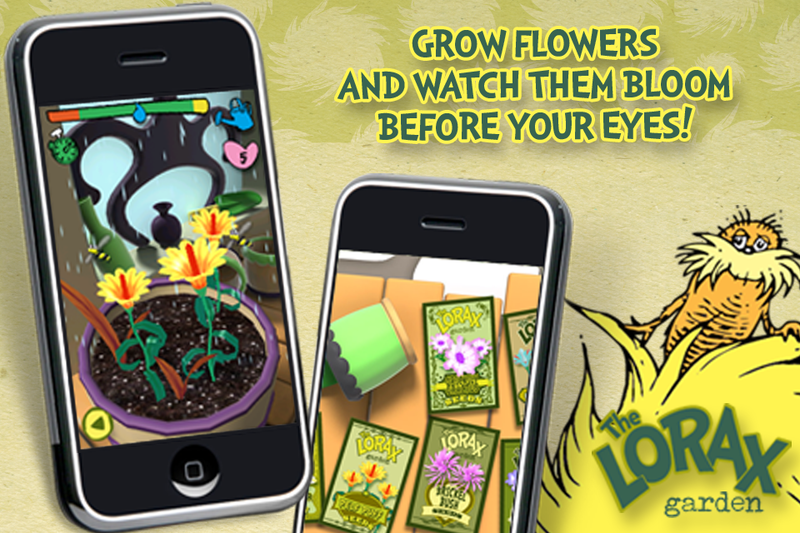 It chronicles the plight of the environment and the Lorax, who speaks for the trees against the greedy Once-ler. As in most of Dr. Seuss works, most of the creatures mentioned are original to the book. The book is commonly recognized as a fable concerning industrialized society, using the literary element of personification to give life to industry as the Once-ler (whose face is never shown in any of the story's illustrations or in the television special) and to the environment as the Lorax. It has become a popular metaphor for those concerned about the environment. 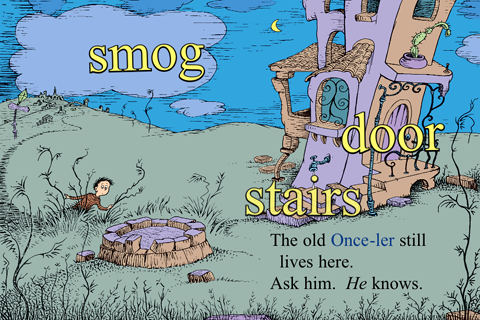 A boy (representing the reader) comes to a desolate corner of town to visit a being called the Once-ler (who is never shown throughout the book except for his arms and legs) and learn about the Lorax. After the Once-ler receives payment from the boy (consisting of 15 cents, a nail, and the shell of a great, great, great grandfather snail) he recounts on how he first arrived where they now stand, back then a beautiful forest of Truffula Trees, colorful woolly trees that were spread throughout the area and supported various fantastical creatures. As the Once-ler arrives in the area with his horse and cart, he takes in the sights. There are Bar-ba-Loots (resembling bears) that frolic about and eat fruit from the trees, Swomee Swans that fly through the air and sing as they go, and Humming Fish that go swimming about in the ponds and humming as they swim. 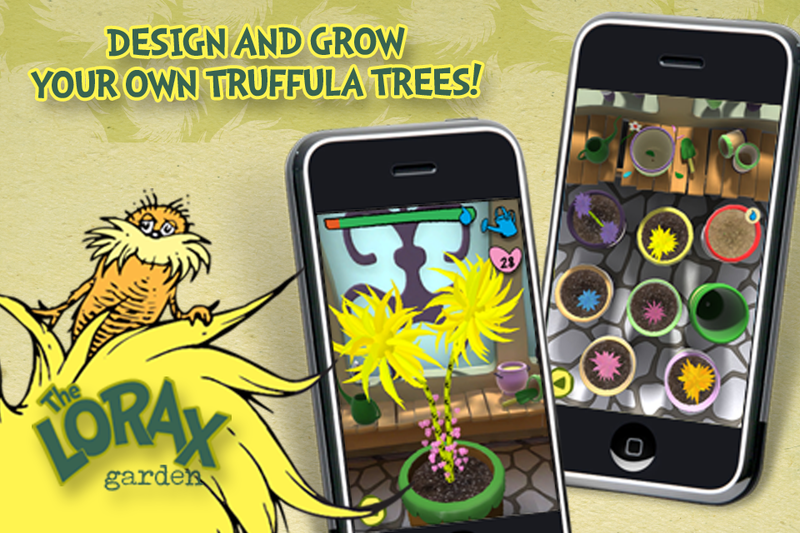 But the Once-ler is only interested in the beauty of the Truffula Trees. Taking a few samples of the Truffula tree, he decides to set up shop on the spot. Enamored by these gorgeous trees, the Once-ler chops one down and uses its foliage to knit a "Thneed", an odd-looking but versatile garment that he insists "everyone needs." A strange creature called the Lorax suddenly emerges from the stump and protests, saying that he "speaks for the trees, as the trees have no tongues," but the Once-ler ignores him and, spurred by greed and the success of his first sale, begins a huge Thneed-making business that brings in his whole family, much to the Lorax's distress. As the Once-ler's small shop grows into a factory and new equipment is being made to keep up with the demand for more Thneeds, signs of damage to the Truffula Forest become evident to the Lorax. The Lorax first complains to the Once-ler that the Truffula trees, being chopped down, were also the food source of the Bar-ba-Loots, who are now facing a terrible food shortage and a disease called "the Crummies because of gas and no food in their tummies." To save them, the Lorax sends them off to find another food source. At first, the Once-ler only shows a little remorse, but still focuses on expanding his business. Soon, the Once-ler's Thneed-making business has expanded tenfold and now uses delivery trucks to take out the shipments. The Lorax eventually comes back complaining to the Once-ler that the factories are belching out so much "smogulous smoke" that it is giving the Swomee Swans sore throats, leaving them unable to sing. After the Lorax sends them off, he also complains to the Once-ler about his machinery making a goo by-product called "Gluppity Glup" and "Shloppity Shlop," and how it's being dumped into the ponds where the Humming Fish live, leaving them unable to hum and forcing the Lorax to send them away too. The Once-ler, however, still dismisses the Lorax's pleadings and goes so far as to berate the Lorax for berating his business. The Lorax's complaints, however, unhappily prove to be true just as the last Truffula Tree gets chopped down. With all the trees gone, no more Thneeds can be made, so the Thneed factories close down and the Once-ler's family departs, leaving the Once-ler alone with the Lorax, who, looking back at the Once-ler sadly, picks himself up by the "seat of his pants" and floats away through a hole in the smog, leaving behind only a small pile of rocks with the word "UNLESS" inscribed into them. The Once-ler alone remains, gazing upon the disintegrating ruins of his factories over the years and contemplating the meaning of this last message, perhaps with a sense of remorse. In the end, the Once-ler gives the boy the very last Truffula seed for him to plant and take care of, potentially regrowing the forest and resulting in the Lorax's return.